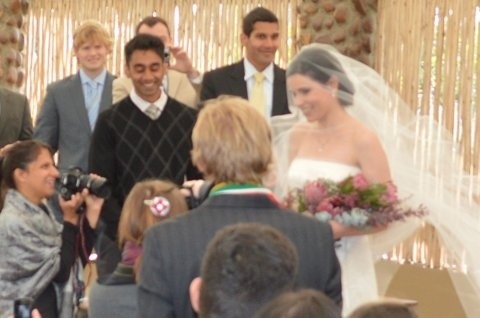 I was honored to be a bridesmaid at the marriage ceremony of my lifelong friend, Donne and Babak which took place on Saturday 17th August 2013 at Lombardini Game Reserve in Jeffreys Bay. They have quite a love story! According to Mahboobeh, Babak’s mom, he had been searching for Donne for a while now and in numerous different countries! Who knew he would find her at a Johnny Clegg concert in Durban during the 2010 soccer world cup!? It was a whole weekend of wedding celebrations! We started with a welcome “braai” on the Friday evening. Guests came from all over the world. Many were from the United States, some from England and others from Iran. If you had any doubts about the couple being suitable for each other, you definitely had no more doubts after you listened to the speeches of their family and friends. They certainly have a lot of love and support! On Saturday morning the big day had finally arrived! Jocelyn, Sue-Anne and I got all dolled up. 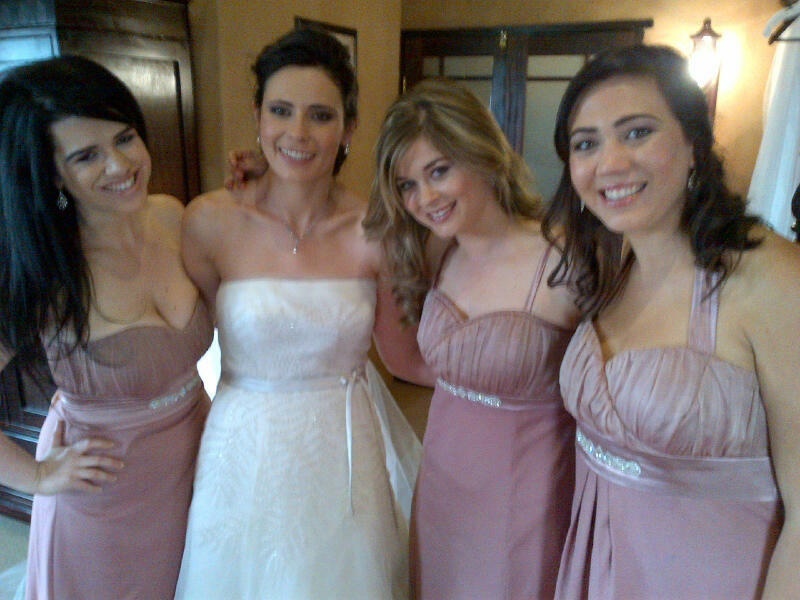 We then helped Donne to get ready at Dio Dell Amore Guest house in JBay. Her hair, her dress and her make-up was absolutely gorgeous. What a stunning bride she was! It made me feel all warm and teary-eyed to see my friend look so beautiful and so happy. Babak is a perfect match for her! 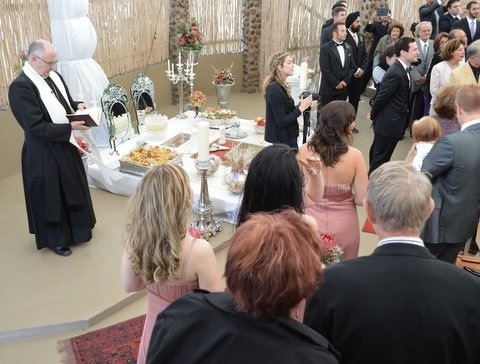 It was an interesting ceremony with Christian and Persian traditions. The chapel was decorated with beautiful bouquets of Eastern Cape flowers. 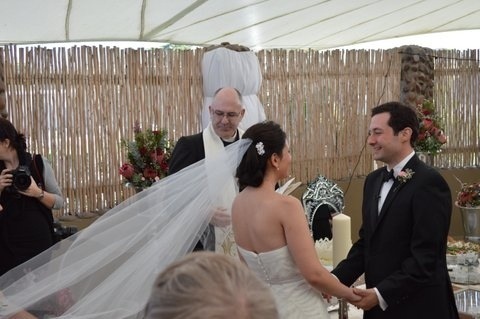 The wind was blazing outside which made our hair and Donne’s veil a bit uncontrollable. The Sofreh which is part of the Persian wedding tradition was laid out at the front of the church. 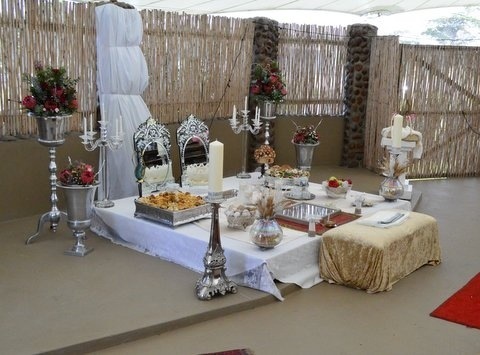 The Sofreh is a spread that contains food and traditional items each with a symbolic meaning. There were amongst other things Ayneh va Shamdum (mirrors and candles) symbolizing purity, light and fire. The lady guests held a blanket over the couple as they sat together facing the mirrors. The ladies also rubbed together blocks of ghand (sugar) to shower the couple with sweetness and happiness. Their persian vows were read in Farsi. The bride does not immediately respond to the vows, which symbolizes that she has given this commitment a great deal of thought. When the bride does not respond members of the audience traditionally respond with joking phrases such as “she has gone to pick roses.”. 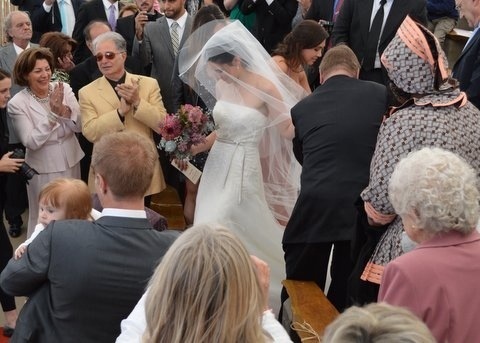 After three repetitions the bride responds….and Donne responded in Farsi which really impressed everyone! I was quite fascinated by the richness of the Persian culture. It was very beautiful and interesting. There’s an ancient Persian tradition that requires one of the bridesmaids to bless the couple by falling down in the aisle while handing out rose petals to the guests… No, not really, but that’s what I told myself and the other guests after I tripped on the carpet in the aisle and fell to the floor with a bang. The sound effect of the audience’s astonished cries at the falling bridesmaid was the worse! Apparently the fall was graceful with a quick recovery so all was fine. I’m glad I could bless the couple in such a way. After the ceremony, while the couple took photos, we ate delicious snacks and drank sherry to keep warm. The reception was a blast. Persians definitely know how to party! It is so good to be at a wedding where one has such peace about the couple and you can see they make each other really happy. We learnt some persian dancing styles and Marc and I did some “sokkie” moves. The next morning at brunch Keith made a very true comment: We are all from different countries and cultures and we all got along so well and had such an enjoyable weekend together. 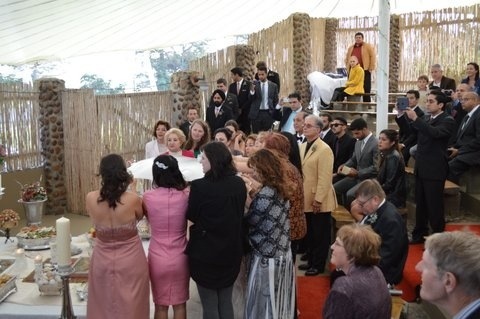 This entry was posted in Interesting, People, Thoughts and tagged donne and babak, Persian wedding. Bookmark the permalink.